I never tire of reading nail blogs. I'm consistently inspired. Sometimes I'll see something so simple and think "Wow, why didn't I think of that?" 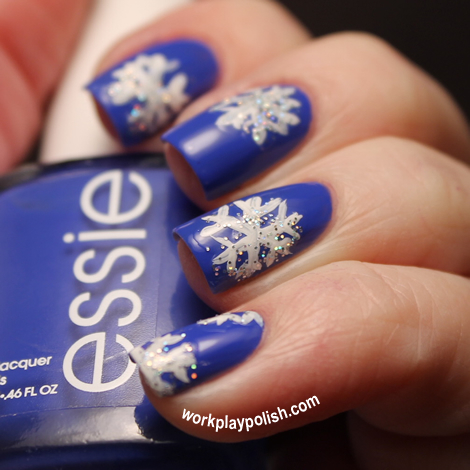 That happened yesterday when I saw this Snowflake mani from The Nail Nerd. 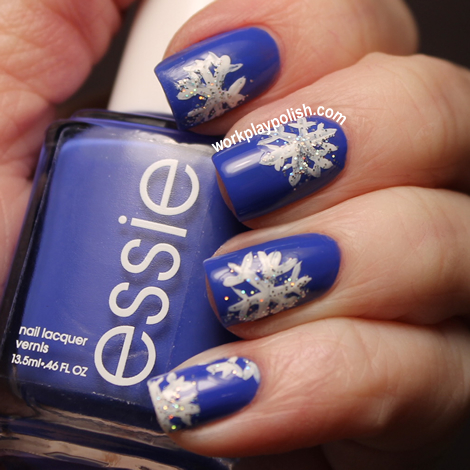 Her version has delicate, pristine, acrylic painted snowflakes on a Deborah Lippmann blue base. Whenever I tried to achieve a similar snowflake look before, the flakes always got lost because white nail polish requires more than one coat. I'm not sure why I never thought to paint snowflakes with acrylic paint. Duh. After the paint dried I sealed it with a coat of Seche Vite. And just because I was feeling extra jazzy, I dabbed on a fine, holographic, no-name, Cynthia Rowley glitter I scored at TJ Maxx. I used the brush right out of the polish bottle and splatted it on and around each snowflake. And did you know that every snowflake has 6 points? So an easy way to draw them is to first make an "X" and then draw a third line through the center. From there...you can add as many branches and lines as you'd like...just make sure you do the same exact thing to all six branches.